Wolverine! Rawr! Claw flail! Hiss! The latest premium wired controller in Razer’s arsenal is a $160 beast with three different kinds of swappable thumbsticks, two directional pads, six remappable triggers and buttons and a band of multicolored LED for flavor. It’s called the Wolverine Ultimate, after the angry weasel. The Wolverine has got a lot going on. Built for the Xbox One and PC, it’s the first Razer console peripheral to integrate Chroma technology, meaning Xbox devs can program in lighting effects and people with the relatively pricey controller will get to enjoy them. It’s got an onboard quick control panel, allowing users to swap programmable button profiles and turn on something called “hair-trigger mode” in an instant. It’s got a range of thumbstick heights to choose from, and if the directional pad in the image atop this article gave you fits, there’s another one that might not. 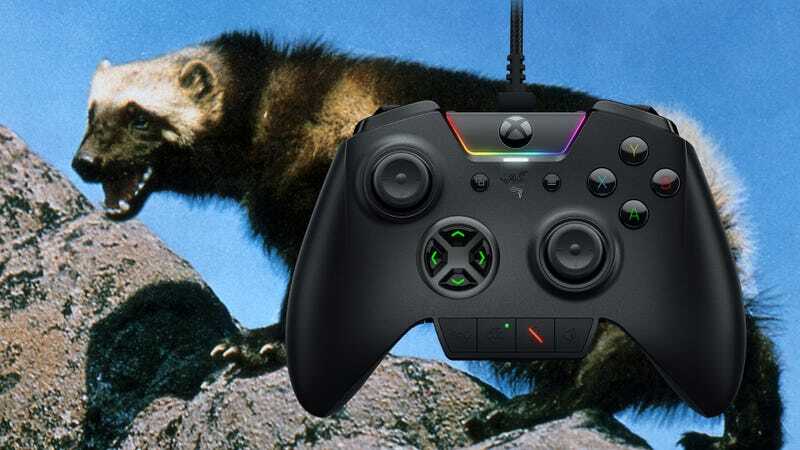 As is the trend with higher-end game pads, the Wolverine even has those paddle buttons on the back of the controller, along with a pair of inside shoulder buttons, all six of which can be remapped to suit the user’s needs. The non-slip rubber grip makes sure they don’t drop the controller while fiddling with all the extra back bits. But the coolest thing is the name. Wolverine. Pass me the Wolverine, Johnson, I have to school some fools in the ways of first-person shooting. Razer’s Ultimate Skunk Ox will be available in Razer’s online store next month.